If you’re looking for something different to do on a Friday night, there’s a free event that easily ranks at the top of the charts. Every week year-round the Emma Chase Café invites musicians of all ages and levels to bring their acoustic instruments to Cottonwood Falls for a jam session. Music lovers like me tune in for a night of old-time bluegrass, folk, country, gospel and rock ‘n’ roll in a relaxed, friendly atmosphere beginning at 7:30 pm every Friday. "[[endteaser]]"
I was looking forward to sitting in my lawn chair under the stars on the bricked street in front of the café, where the sounds of guitars, banjos and fiddles would soothe my soul in the cool of the evening. Unfortunately, it was a steamy 104 degrees that night, so the jam session moved indoors as it does whenever the weather is inhospitable. Fortunately, just a block up the street from the café is the Emma Chase Music Hall, that houses Prairie PastTimes, a store front for 30 talented Flint Hills craftspeople. Their handmade wares, everything from quilts to blown glass to ironwork, occupy the perimeter of the shop, leaving the center space open for jam sessions and other music events. Before the night was over, Hubby and I became the proud owners of a hand-crafted wooden cross. One of the performers would step to the microphone, inform the others what key the song was in, and start to sing a favorite tune. The others, ranging in age from youngsters just learning to play to seasoned senior citizens and wearing everything from cowboy hats to tennis shoes, would join in on guitar, fiddle, mandolin, base, harmonica, piano or juice harp, as if they had been practicing together for months. 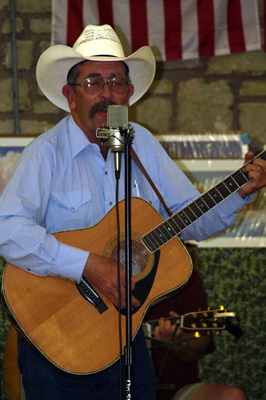 The music included fun songs for kids, Willie Nelson tunes, original compositions, and favorite hymns and patriotic songs that invited audience participation.The jam sessions, which began in 1999, were voted one of the 8 Wonders of Kansas Customs by the Kansas Sampler Foundation. What is one of your favorite Kansas music events?